After being in headlines for her royal destination wedding with American singer Nick Jonas, Desi girl Priyanka Chopra is getting back to work and promoting her upcoming Hollywood flick ‘Isn’t It Romantic’. Priyanka shared an Instagram picture of herself on Wednesday and informed her fans that she would be appearing in the next episode of ‘The Ellen Show’, hosted by Ellen DeGeneres. After her wedding it was Priyanka’s first appearance on any show, and just like all of us show’s host Ellen was also pretty curious about Priyanka and Nick Jonas’ big fat wedding. The official Instagram handle of Ellen’s Show put out a video of the two of them. “Tomorrow, @PriyankaChopra tells me how her husband @NickJonas slid into her DMs”, handle wrote by Sharing the clip. Tomorrow, @PriyankaChopra tells me how her husband @NickJonas slid into her DMs. Priyanka also revealed that her mother Madhu Chopra wasn’t too happy with the 200-only-guest list. “For an Indian family and an Indian wedding, that’s less. My mother was so upset with me the whole time that she was like ‘I need to have another party for the 150 thousand people I know. How can I not invite my jeweler, how can I not invite my hairdresser? So this was the whole conversation,” Priyanka told Ellen on the show. 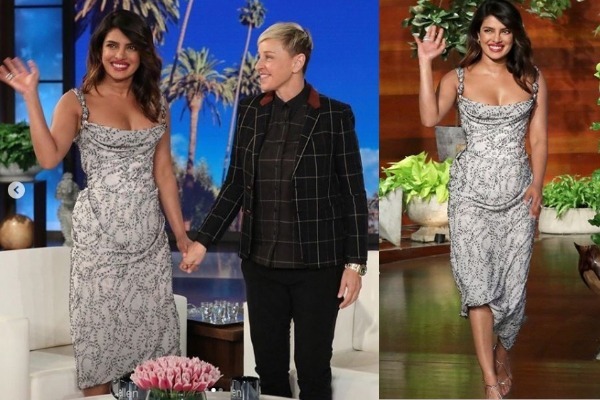 Ellen gifted Priyanka a wedding gift which was even more interesting. The 36-year-old actress also talked about her next Hollywood project, which she is also producing. Priyanka will be essaying the role of spiritual leader and Osho’s disciple Ma Anand Sheela in her next film, which will be directed by Oscar-winning director Barry Levinson. I am developing a feature with Barry Levinson. He is an iconic American director. We are developing it (from the perspective of) Sheela, who is an Indian-born American–Swiss former spokeswoman of Osho. She was his right hand woman and she was devious. She created a whole cult in America. He was called Osho. I don’t know if you’ve heard of him. It was amazing. I am developing that next for me to star in and produce,” Priyanka said on the show. This was the second appearance of Priyanka on Ellen DeGeneres’s chat show. Last time Priyanka was on the chat show in 2016, before the release of her Hollywood debut film ‘Baywatch’. This time, she is promoting her upcoming film ‘Isn’t It Romantic’ alongside Rebel Wilson and Liam Hemsworth, which releases on February 13 in the US. Priyanka will also be seen in Shonali Bose’s ‘The Sky Is Pink’, co-starring Farhan Akhtar and Zaira Wasim.